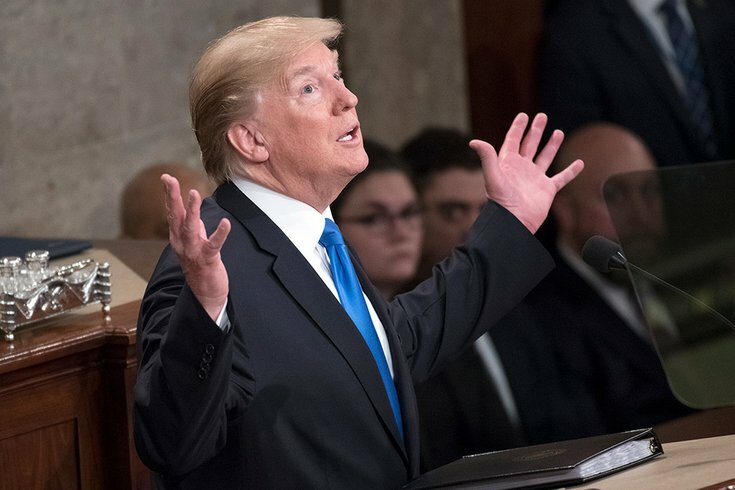 President Donald J. Trump delivers his first State of the Union address in Washington, D.C., on Jan. 30, 2018. New Jersey lawmakers are advancing a bill that, if successful, could prevent President Donald Trump from appearing on the state's ballots during the 2020 general election. The new measure would require all presidential and vice presidential candidates release at least five years' worth of federal tax returns in order to appear on the New Jersey ballot. Trump, now in his third year of serving as president, famously has yet to disclose any of his tax returns – the first president in the last 40 years not to do so. With the potential legislation, if Trump does not release his taxes prior the next election, he could be written off the New Jersey ballot entirely. New Jersey's Democratic-led Senate passed the legislation 24-11; it will now go to the Democratic-led Assembly. If successful there, Gov. Phil Murphy would have the opportunity to sign it. In a previous attempt to pass this legislation in 2017, former Gov. Chris Christie vetoed the bill, proclaiming it a "transparent political stunt." If the proposed legislation gets signed by Murphy, New Jersey will be the first state with a law making it a requirement that candidates' release their tax returns to the public. In addition to disclosing five years of tax returns, the bill proposes requiring that candidates must offer written consent for disclosure no later than 50 days before the general election. The tax returns would then be published by the Division of Elections in the Department of State within seven days of receipt. Trump's decision not to disclose his tax returns has raised suspicion among the public and his adversaries alike, particularly about his purported financial dealings with Russia and his additional income outside of the White House. Trump has claimed that he has not released his tax returns because he has been under audit since 2009, though the IRS said an audit does not stop an individual from disclosing his taxes while being reviewed. New Jersey is not the first state to propose such legislation. In 2017, California's Democratic Gov. Jerry Brown rejected a similar bill in his state that would have required candidates to publish their tax returns from the past five years. "I worry about the political perils of individual states seeking to regulate presidential elections in this manner,” Brown wrote when he vetoed the bill. Brown explained that such a law may be unconstitutional, and it would set a "slippery slope precedent" that could lead to the requiring health records or birth certificates of presidential candidates. At least 30 other states have tried to pass similar ballot policies, but none have been successful.